Conference Theme: "Learning from each other to improve care for women"
For more information about this year's conference, please contact us. Photos of the day can be found on our Facebook page. Clitoral Reconstruction following FGM. What is the evidence? Should clitoral reconstruction be offered in the UK? Conference Theme: "FGM - Working in Partnership"
For further information, please contact Lola Daranijoh. On Wednesday 21st September 2011, the FGM National Clinical Group held a conference in Birmingham. The theme of the conference was "FGM - Working in Partnership". During the conference, evaluation forms were distributed to assess how the conference was received. Participants were asked to rate the content, educational content, delivery of lectures, venue, catering and overall impression of the conference. They were also asked to comment on their reasons for attending the conference, whether the conference fulfilled their needs, what they enjoyed about the conference, and what could be done to improve the conference. Overall there were 28 participants who completed the conference evaluation form. 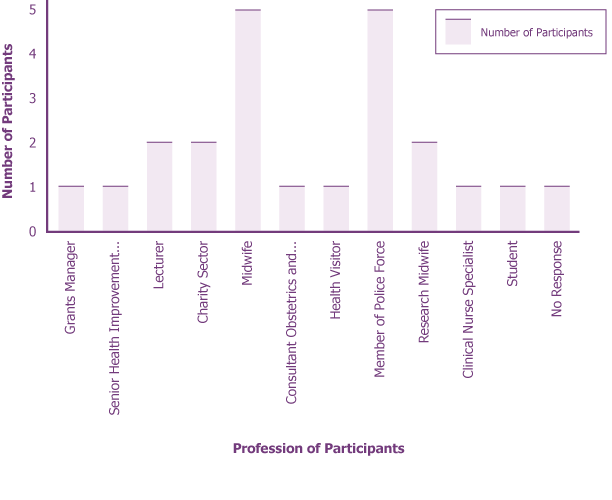 Figure 1 describes the profession of the participants involved. Figure 2. Indicates that a majority of participants (36%) were made aware of the conference through friends or colleagues. 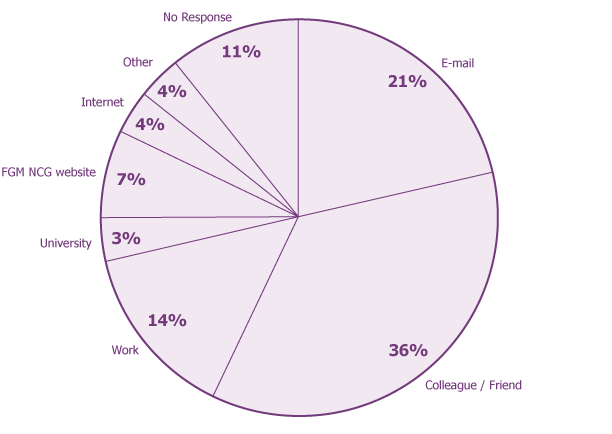 21% of participants heard about the conference via email and a further 14% heard about the conference at work. When asked to evaluate the content, educational content, delivery of lectures, venue, catering and overall impression of the conference; participants were asked to numerically rate these categories between the values of 1 (very poor) and 5 (very good). Table 1 shows the results. Table 1. Participant responses concerning content, educational content, delivery of lectures, venue, catering and overall impression of the conference. As table 1 shows, the majority of participants felt that the content of the conference was very good, ranking it as 5. 13 participants gave the conference content a score of 4. None of the participants gave the content a score lower than 4. The majority of participants (n=16) also thought that the educational content of the conference was very good. 11 participants ranked the educational content as 4. Only 1 participant gave a score of 3 for this category. None of the participants chose to rank the educational content as 1 (very poor) or 2. Category 5 (very good) was also the most common response concerning the delivery of lectures, with 14 participants choosing this category. Following this, 12 participants ranked the delivery of lectures as 4. 2 participants gave a response of 3, however none of the participants ranked it as category 1 or 2. For the category of venue, most participants gave a value of 4. However 5 participants gave the venue a value of 3 and 1 participant gave a value of 2. Comments were made on the evaluation forms about the venue being too cold and also about the difficulty of parking. The catering at the conference was well received, with 12 participants ranking it with the highest value of 5 and 12 participants ranking it a value of 4. No participants stated that the catering was very poor. The overall impression of the conference was very good, with 18 participants choosing this category. The remaining participants to answer this question gave a value of 4 for their overall impression of the conference. Participants were also asked what they hoped to gain from the conference and two themes emerged from the responses given. Firstly, acquiring knowledge, information and understandings of FGM was a theme from the responses, with participants stating that they wished to gain a ‘better understanding of FGM’ and hear about ‘up to date knowledge’ on the subject. Secondly, many participants stated that they hoped to be able to network at the conference. One participant stated that their aim was ‘making contacts to support women with FGM’. Networking was a popular theme within this category. When asked to comment on what they had enjoyed about the conference there was a variety of responses related to: the presentations, the gaining of knowledge and information sharing, networking, and the multi-disciplinary approach. The speakers at the conference were also praised in this section, with one participant stating that they had enjoyed ‘The passion of the speakers’ and another stating ‘Really inspiring speakers’. Another participant stated that they had enjoyed ‘Being part of a conference where most know about FGM’. When asked how the conference could be improved, 12 of the 28 respondents thought that the conference did not need any improvement. Some participants did however express that the venue could be improved, as it was too cold (n=3) and there was difficulty parking (n=2). Others suggested that it would have been useful to hear accounts of women who have undergone FGM. One participant also felt that it would be useful to involve social care into future conferences. Others felt that there could have been more speakers and more research focused. Another respondent suggested that it would be good to ‘open the conference to more people with more varied backgrounds’. Interactive sessions were also suggested as a way to improve the conference, along with more publicity for the conference, and information on health commissioning. Overall the conference was well received, as seen through the variety of positive comments made by the respondents. Many participants felt that the FGM NCG conference did not need improvement and any the suggested improvements were minimal. Conference Theme: "Safeguarding Women & Children"
After a very successful conference in 2008, we were very excited at the prospect of our second event in London within the theme of safeguarding women and children in the UK whom at risk of FGM. We will also launch an educational DVD which clearly instructs and shows doctors, midwives and nurses how to undertake a reversal operation. We were delighted to have both international and national speakers at the event including Professor Dame Christine Beasley Chief Nurse for England, Professor Sir Sabaratnam Arul Kumaran, President of the Royal College of Obstetricians, plus our two patrons, Baroness Ruth Rendell and Professor Cathy Warwick CBE, the General Secretary of the Royal College of Midwives. Conference Theme: "FGM in a Globalised Age"
Conference Theme: "Female Genital Mutilation in a Globalised Age"